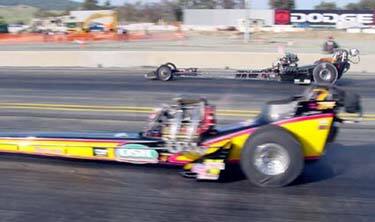 After their 5.81 - 255 at Bakersfield, Jim Murphy, Tim Beebe and the WW2-OSH Racing team came to Sonoma with high hopes of a 5.7 run. 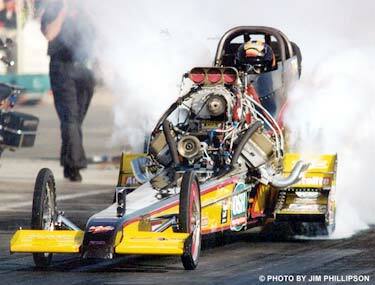 Drag racing being the unpredictable and heartless beast it is, those hopes were dashed by parts and human failure. 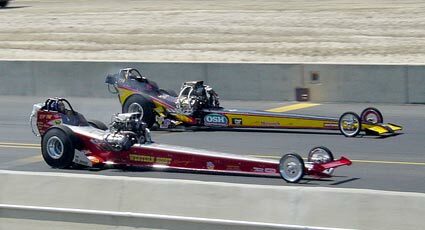 Murphy qualified an uncharacteristic 13th then lost a very close first round race to Bob Muravez. After spinning the tires in his first qualifying attempt, Murphy got into the show in session two in spite of severe engine problems. Here the WW2 car leaves ahead of Rance McDaniel who clicked off a 5.95. 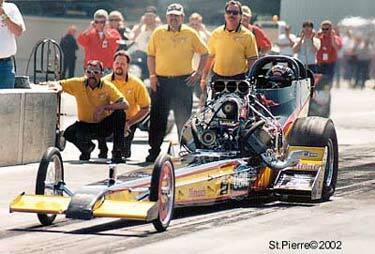 At the finish line Murphy wasn't that far behind (below) with a shut off 6.26 at just 182 MPH. 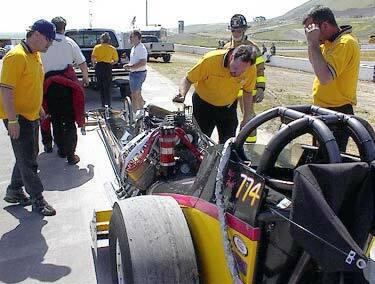 The car was running very good until an engine failure toward the finish line forced Murphy to shut it down. 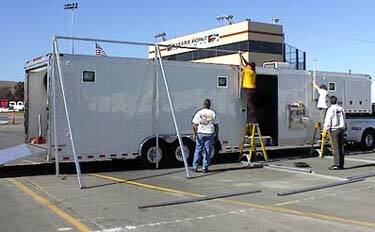 Backing up to Friday afternoon, every race starts with the time consuming but necessary "set-up". 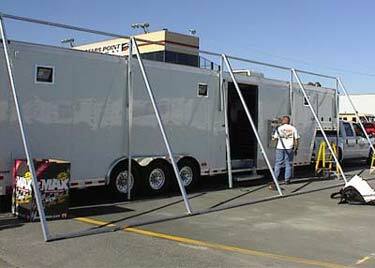 Here the new WW2-OSH trailer is in place and the crew is starting to make the pit "battle ready". 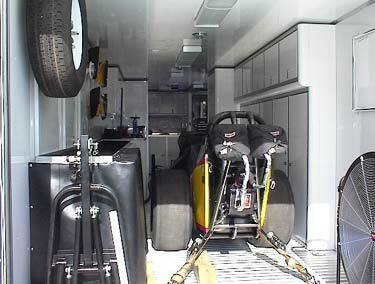 Until the awning, tables and other facilities necessary to work on the car are ready, the dragster remains "in the box". The first round of qualifying brought a mixed bag of results. In spite of a few stout times, most of the cars had trouble hooking up after the eighth mile mark. 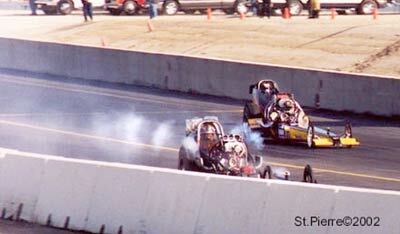 Here both Murphy and John Shoemaker were very busy in their respective lanes both ending up to the right. Murphy 6.39 @ 172 -- Shoemaker 6.48 @ 197. Murphy had no trouble launching like a rocket on every pass - the problems bit him on the other end. After the second qualifying session the crew had to replace the damaged supercharger that cut the run short after it "banged" at about the 1000 foot mark. The failure was due to a faulty valve in the fuel system. 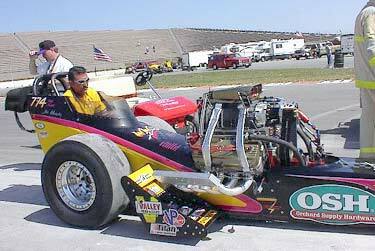 Although its one of the best prepped cars at any race, nobody can foresee the "little things" that can bite you every time these big nitro burning engines go down the track. 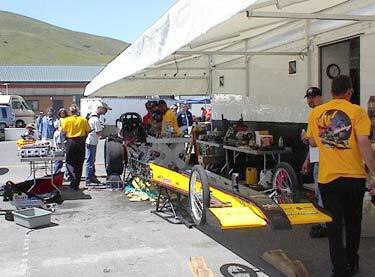 After the second qualifying session the WW2-OSH dragster was in pieces. 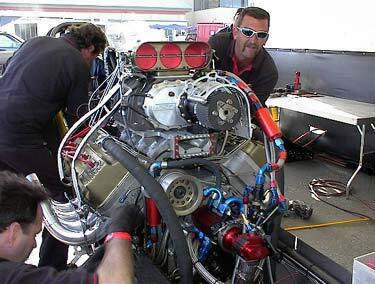 The problem that caused the blower backfire also caused an internal engine parts failure. 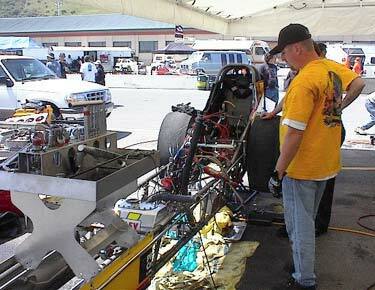 The failure necessitated a complete engine change - something nobody likes to do at a race. 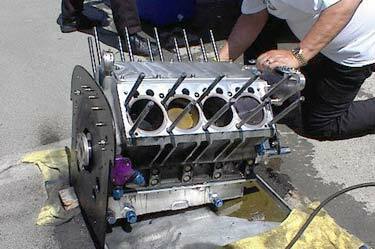 The damage engine is stripped of useable parts as the spare is installed in the race car. An experienced crew, such as this can change engines in a surprisingly short period of time - usually less than 90 minutes. Car repair or even normal maintenance is always a group effort. Even the wives have jobs to do. Fortunately this was after the last qualifying session on Saturday so there was no panic to get the car back together in record time. They had until the next day to make sure it was repaired correctly. In the first round of eliminations Bob Muravez got a slight starting line advantage over Murphy and that was what he needed to win the race. In an incredibly close finish Muravez's 0.487 to a 0.526 advantage allowed him to capture the win 6.069 @ 230.76 to Murphy's quicker and faster 6.052 @ 240.98 (top speed of the event). 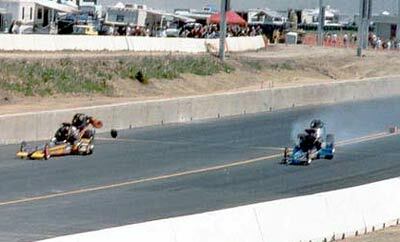 This one falls under the category of "that's drag racing". Murphy's margin of defeat was about 3 feet! After the first round loss, even more engine damage was present. Jim Murphy and Tim Beebe vow that these kinds of problems will come to an end with a new and much more aggressive maintenance program.